Eve Marder, the Victor and Gwendolyn Beinfield Professor of Neuroscience, has received the 2019 National Academy of Sciences Award in the Neurosciences. 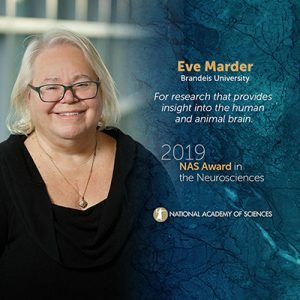 The National Academy of Sciences is recognizing “Marder’s research of over more than 40 years that has provided transformative insight into the fundamental processes of animal and human brains.” NAS also called Marder “one of the most influential neuroscientists of her generation”. In addition to her research, NAS acknowledged Marder’s impact upon young scientists working in her field. She has served as a mentor to “generations of neuroscientists”. A book titled “Lessons from the Lobster: Eve Marder’s Work in Neuroscience” by Charlotte Nassim and was published in 2018. The NAS Award in the Neurosciences is given only once every three years. 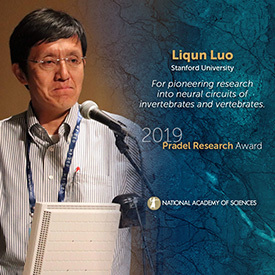 Luo earned his Ph.D. in Biology from Brandeis in 1992. He worked in Kalpana White’s lab. He is now a Professor and HHMI Investigator at Stanford University. Read more at Brandeis Now. 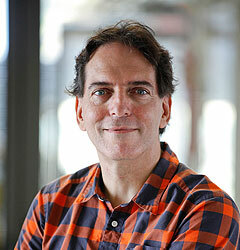 Congratulations to Jeff Gelles, Aron and Imre Tauber Professor of Biochemistry and Molecular Pharmacology. He will receive the 2019 Kazuhito Kinosita Award in Single-Molecule Biophysics from the Biophysical Society (BPS). He will be honored at the Society’s 63rd Annual Meeting at the Baltimore Convention Center on March 5, 2019, during the annual Awards Symposium. Assistant Professor of Biochemistry Tijana Ivanovic has received a 2017 NIH Director’s New Innovator Award. This award is part of the NIH’s High-Risk, High-Reward Research program, designed to fund early career investigators who propose innovative and potentially transformative projects. Ivanovic will receive $1,500,000 in direct costs over five years to spearhead a research program aimed at comprehensively characterizing molecular changes in the viral cell-entry protein hemagglutinin (HA) that define pandemic influenza viruses. With the generated insights, Ivanovic hopes to ultimately be in a position to predict the pandemic potential of influenza viruses circulating in nature. HA densely covers the influenza virion surface, where it allows the virus to both recognize and penetrate (fuse with) the cells of its host. HA is also a key target of neutralizing antibodies that protect us from influenza infection. An influenza pandemic is characterized by the adaptation of a new HA subtype to cell entry into human cells (of what was originally an avian virus). Without the pre-existing immunity to protect us, the virus quickly spreads around the globe. During pandemic adaptation, both HA functions in target-cell recognition and membrane fusion undergo key molecular changes. Ivanovic will use a custom-built Total Internal Reflection Fluorescence Microscope (TIRFM) to visualize, in real time, individual virus particles as they engage and fuse with target cell membranes. This system will allow her to obtain large-scale quantitative information about distinct HA functions at an unprecedented level of detail. She will compare avian viruses with their evolutionary offspring that infected humans, including past pandemic strains. She hopes to develop models for predicting which viruses will lead to a major flu outbreak. Ivanovic obtained a PhD in virology from Harvard University and carried out postdoctoral research with Stephen Harrison in molecular biophysics. 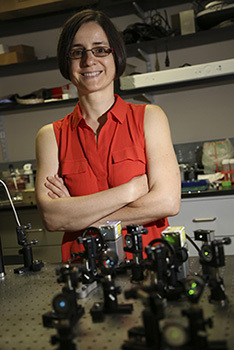 She integrates these diverse backgrounds in her laboratory, where members are trained across these two and other synergistic areas (such as laser microscope optics, and analytical and computational modeling). The funds from the New Innovator award have created new opportunities for hiring, and the lab is actively recruiting postdocs, PhD students (from the Biochemistry and Biophysics, Molecular and Cell Biology, and Physics graduate programs) and undergraduate researchers to undertake this ambitious program. The International Society for Artificial Life. has awarded a lifetime achievement award to Jordan Pollack, Professor of Computer Science and Chairman of Computer Science department, for his work on robotics, computer-simulated evolution and artificial life forms. 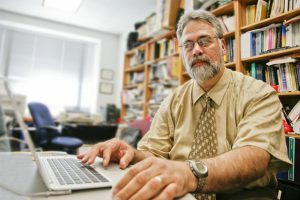 Pollack, who has been a Brandeis faculty member for the past 23 years, is also the director of the Dynamical & Evolutionary Machine Organization (DEMO). DEMO is a research lab where Pollack and his students study recurrent neural networks, evolutionary computation, and dynamical systems. Pollack received the lifetime award last week (September 4-8) at The European Conference on Artificial Life 2017 in Lyon, France. Nick Moran and Jordan Pollack’s paper “Effects of Cooperative and Competitive Coevolution on Complexity in a Linguistic Prediction Game” (MITCogNet) also received the best paper award at the conference. In an interview with Brandeis Now, Professor Pollack discusses his career and research. Assistant Professor of Biology Amy Si-Ying Lee was named a 2017 Searle Scholar, receiving $300,000 in flexible funding to support her work over the next three years. Lee’s research is focused on discovering how gene regulation occurs through novel mechanisms of mRNA translation. Specifically, her lab studies how non-canonical translation pathways shape cell growth and differentiation, and why defects in mRNA translation lead to developmental disorders and cancer. Lee, who came to Brandeis in Summer 2016, has a PhD form Harvard and did her postdoc at UC Berkeley. She has also been awarded a 2017 Sloan Research Fellowship and in January won the Charles H. Hood Foundation Child Health Research Award. Lee’s lab is up and running and recruiting postdocs and PhD students (through the Molecular & Cell Biology and Biochemistry & Biophysics graduate programs). In Fall 2017, Lee will teach BIOL 105, Molecular Biology. On August 1, Amy Lee joined the Biology department as an Assistant Professor. Previously, Amy was an American Cancer Society Postdoctoral Scholar in Jamie Cate’s lab at University of California, Berkeley. She received her Ph.D. in Virology from Harvard University in Sean Whelan’s lab and her Bachelors of Science in Biology from Massachusetts Institute of Technology. Amy’s research focuses on understanding how gene regulation shapes cell growth and differentiation, and how dysregulation leads to human diseases like carcinogenesis and neurodegeneration. She is interested in discovering new mechanisms of mRNA translation initiation and novel functions of RNA-binding proteins and eukaryotic translation factors. Her research combines genome-wide and computational approaches together with molecular genetics, cell biology, biochemistry, and structural biology techniques. Amy recently published a paper in Nature together with the Jamie Cate, Jennifer Doudna, and Philip Kranzusch describing the discovery of a new translation pathway that controls the production of proteins critical to regulating the growth and proliferation of cells. Cancer is characterized by uncontrolled cell growth, which means the protein production machinery goes into overdrive to provide the building materials and control systems for new cells. Hence, biologists for decades have studied the proteins that control how genes are transcribed into mRNA and how the mRNA is read and translated into a functioning protein. One key insight more than 40 years ago was that a so-called initiation protein must bind to a chemical handle on the end of each mRNA to start it through the protein manufacturing plant, the ribosome. Until now, this initiation protein was thought to be eIF4E (eukaryotic initiation factor 4E) for all mRNAs. Amy and her colleagues discovered that for a certain specialized subset of mRNAs – most of which have been linked somehow to cancer – initiation is triggered by a different protein, called eIF3d. The finding was a surprise because the protein is part of an assembly of 13 proteins called eIF3 -eukaryotic initiation factor 3 – that has been known and studied for nearly 50 years, and no one suspected its undercover role in the cell. This may be because eIF3’s ability to selectively control mRNA translation is turned on only when it binds to the set of specialized mRNAs. Binding between eIF3 and these mRNAs opens up a pocket in eIF3d that then latches onto the end-cap of mRNA to trigger the translation process. Subsequent X-ray crystallography of eIF3d revealed the structural rearrangements that must occur when eIF3 binds to the mRNA tag and which open up the cap-binding pocket. 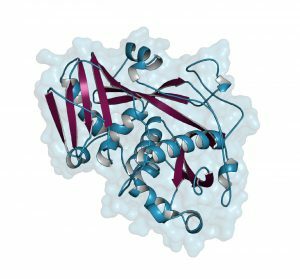 eIF3d thus presents a promising new drug target in cancer, as a drug blocking this binding protein could shut off translation of only the growth-promoting proteins and not other life-critical proteins inside the cell. Lee AS, Kranzusch PJ, Doudna JA, Cate JH. 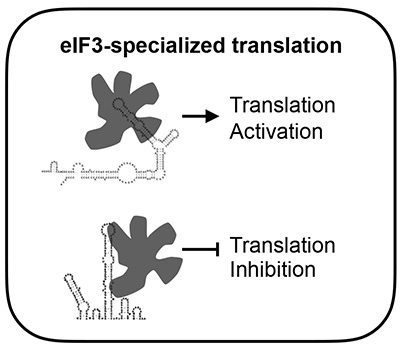 eIF3d is an mRNA cap-binding protein that is required for specialized translation initiation. Nature. 2016.